The Story of Christmas is retold by Gwen Ellis as a book for children. Beginning with the story of John’s birth to Zechariah and Elizabeth and leading seamlessly into the foretelling Jesus’ birth, there is a quick interaction perfect for children to engage. It is not made very clear why John is so important to the greater story of Jesus. So that clarification may be left to the reader. The layout of the words, while short and quick, is a bit awkward. The sentence flow can be a bit confusing for the audible reader due simply to the line breaks on the page. I read it out loud as though reading to son or daughter and stumbled over the line breaks a few times. It is important to stress it is solely due to the line breaks of the layout and nothing to do with the grammar of the writer. At the bottom each second page, there is a question to prompt discussion with whomever you are reading. They engage the reader and listener with the heart of what the story really addresses. There would be a pretty strong disservice to overlooking the questions to skirt you way to the end. The game in the back is a good idea to challenge the reader and listener to determine whether or not they could put the entire story in the right order using only pictures illustrated by Steve Smallman. Overall, the illustrations are lively and appealing to children. It is bright and attractive. All the characters look incredibly similar, and that is not a comment on the reality they are all Caucasian save one lone wise man. The reality is the characters all have the same nose and face with different hair color. The accompanying DVD begins with an obvious menu created in iMovie, which automatically brings to mind something I could do on my macbook in my home office. It is a little off-putting. The story chapters on the DVD are quite short. One may say they are shorter than the average child’s attention span. A little more effort could have been made to make each story open up more. 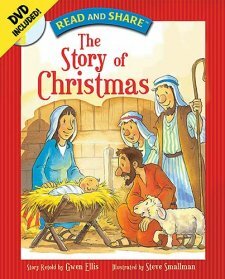 The DVD goes beyond the story portrayed in the book, extending into the story of Jesus as a boy teaching in the temple. There is a quick retelling of the temptation of Jesus as well as a very brief unfolding of the entirety of Jesus life of healing and teaching. I cannot recall the last time I heard the term CD-ROM, but the DVD does have a CDR option available on it complete with printable coloring pages and a couple computer wallpapers if you are interested. The pictures are primarily of animals, and the wallpapers are open to taste.